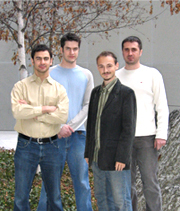 Alex Shapiro founded TouchGraph, LLC in 2001, and created the original visual browser for Google. Alex�s experience in the software industry includes consulting for Sapient Corp, developing a trading portal for Goldman Sachs, and building market analysis applications for Futurebrand. He has also worked with companies such as Eli Lilly, Telefonica, and CIBC. Through his work at TouchGraph, Alex has found a way to combine his interests in algorithm design, psychology, sociology, art, linguistics, and user interfaces. Alex won the award for independent research in computer science at Columbia University, where he earned his degree in Computer Science. Edvin's area of expertise is in creating system architectures for algorithmically intensive applications. Prior to his work with TouchGraph, Edvin designed client side components for a popular distributed music sharing application. Edvin has worked on a range of projects dealing with artificial intelligence, computer vision, and natural language processing. He earned dual degrees in computer science and mathematics from Columbia University. Jon has extensive experience in application design and in implementing complex algorithms. Jon previously developed 3D Graphics software for streaming with television broadcasts. He earned a visiting researcher fellowship at IBM Canada, where he studied Peer-to-Peer network simulation and worked on the Eclipse project. Jon received a Masters Degree in Computer Science from Carleton University in Ottawa, Canada. He performed graduate research in the areas of Graph Drawing, Graph Theory, Advanced Data Structures, Genetic Algorithms, Image Processing, and Peer-to-Peer networking. Ben Zhuk has over 12 years of experience in Internet development and marketing strategy. Ben has worked with boutique investment banks such as Financo, Inc. and with consumer products companies such as Johnson & Johnson and Splenda to improve their products and their customer communication strategies. He is a founding member of Antenna Consulting, a branding and user experience agency based in NYC.